"I sent a scouting report to every club in England and Scotland. I just got a bunch of envelopes and addressed them to 'the manager'." 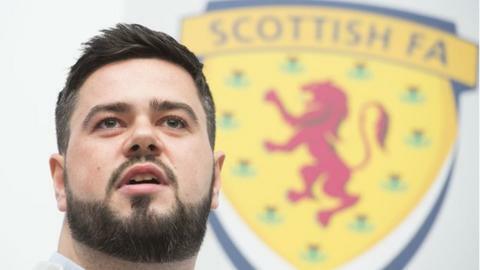 Robert Rowan was an 18-year-old college student from Fife when he sent out the dossiers on the Champions League final between Manchester United and Barcelona in Rome. It was a punt that would earn him scouting roles with Celtic, then the Scotland national team, and a stint during which he combined working in a bank with being the sporting director of Scottish League One side Stenhousemuir, before joining Brentford in 2014. At the time of his death from heart failure in November, 2018, at the age of 28, Rowan was the Championship club's technical director. The club's co-director of football Rasmus Ankersen described him as "not only an ambitious colleague who kept pushing the club forward but also a warm, funny and trusted man". But how did a teenager with no football experience end up such a pivotal figure in one of the world's biggest leagues at such a young age? When football-daft teenager Rowan spotted the internet leak of a scouting report Andre Villas-Boas had compiled for Jose Mourinho's Chelsea a few weeks earlier, he thought he'd have a go at writing one himself. Remarkably, Nottingham Forest, West Ham and Celtic replied to his mail shot, with the last inviting him for a meeting in Glasgow. Rowan had never been to Scotland's largest city on his own before. In fact, he hadn't been to many places outside the small town of Kirkcaldy in which he grew up. "My mate was at university in Glasgow so he met me and we decided, for some reason, to walk to Celtic Park," he told BBC Sport in 2016. "By the time we got there we were soaking. "When I was inside speaking to them, I could see my mate outside in the car park huddled under a £1 umbrella that we bought from a guy on the road side. Thinking back, I wouldn't do it that way again." Despite the shambolic scene, Rowan impressed enough to be invited to work with Celtic's youth and under-21 sides, scouting opposition teams. "I was young and naive and there was nothing too complicated about the reports," he said. "I wasn't cocky but I had nothing to lose and wanted to give it a shot." Rowan had been at Celtic for a year when Mick Oliver - chief scout for then-Scotland manager Craig Levein - asked him to meet at a non-descript hotel in a non-descript part of central Scotland. The two had never spoken before but Oliver handed over footage of Slovenia and asked the wide-eyed 20-year-old to write a report on how the national team's next opponents played. "It must have been okay because he gave me a job," he said. That job, which entailed tracking players from other countries, looking at potential Scotland internationals and recruiting pupils for the Scottish FA's performance schools, ended when Levein was sacked. Thinking his hopes of a career in football were over, Rowan started a traineeship with a bank. Then came another opportunity. Former Scotland striker Scott Booth, with whom he had worked at the Scottish FA, was appointed Stenhousemuir manager and asked him to get involved with the part-time club. "I jokingly told him I'd only do it if I could be the sporting director, but Stenhousemuir had never had one before," he said. "I didn't think for a minute it would work and, actually, I don't think the club were ever convinced they needed me, but they let me have a go at it." Filming games, showing clips to players and holding analysis sessions may not seem revolutionary, but it was entirely alien to a squad of joiners, plumbers and policemen to be asked to turn up for an additional third training session every week. Throughout that time, Rowan continued his traineeship and was beginning to consider it his career until two interviews in the space of two days in August 2014 rekindled his hopes of a job in football. The "Brentford thing" involved a trip to Blackpool on a Tuesday night. The west London club were playing Blackpool and - thanks to his friendship with then-assistant manager Davie Weir - they asked Rowan to meet them pre-match to discuss a position as scouting co-ordinator and join them to watch the game. "The problem was, I was working the next morning so I had to drive down then leave pretty much straight away after the chat," he recalled. "I remember heading up the road to Kirkcaldy really hoping I'd get the job but at the back of my mind I was thinking 'aww man, I've got work in the bank tomorrow morning'. "But a few weeks later, after hearing nothing, I got a call at work one day and ended up hiding in a toilet cubicle listening to Brentford's director of football talking about salaries, contracts and start dates." A few months after arriving at Brentford - and being promoted to head of football operations - Rowan found himself stuck in the middle of a schism between owner Matthew Benham and the management. Director of football Frank McParland, manager Mark Warburton, and assistant Weir were not convinced by professional gambler Benham's statistical modelling strategy. But Rowan was an enthusiastic disciple, insisting on spending one day a week studying at Benham's Smartodds statistics company throughout his first year at the west London club. "That was a tricky time for me personally but I learned a lot and I've done a lot," he said two years ago. "In a way, it was good for me to be thrown into that situation because I just had to get on with it and it's given me the kind of experience that very few people my age have, in whatever industry they work in." That experience attracted an offer from Celtic a couple of years ago to work with their first team and an interview with Rangers last year when they were searching for a director of football. However, Rowan opted to stay in England, where his remit had evolved into the role of technical director. It was a role in which he was making a name for himself at the time of his death. "We are all simply devastated with this news," said Brentford chief executive Mark Devlin. "Rob was a terrific man and a great character around the club. We will all miss him greatly."